The last week has been subdued in terms of Bitcoin market activity, but we had two important developments. The first was the emergence of huobi as the new premier Bitcoin exchange of China and the world. This caused the second big development, which is a breakout above the decreasing trendline we had talked about last week. This breakout happened with seemingly ordinary volumes on Bitstamp, but good volumes are visible on huobi at this period. The fact that prices have not continued rising very strongly after this breakout suggest that it is not a bonafide uptrend yet. We are very far from setting a higher high at this point, and it is not prudent to call this a long term uptrend yet. It’s a watch-and-wait recommendation at this stage, and a definitive market move is expected after new year’s as people slowly return to trading from holidays. 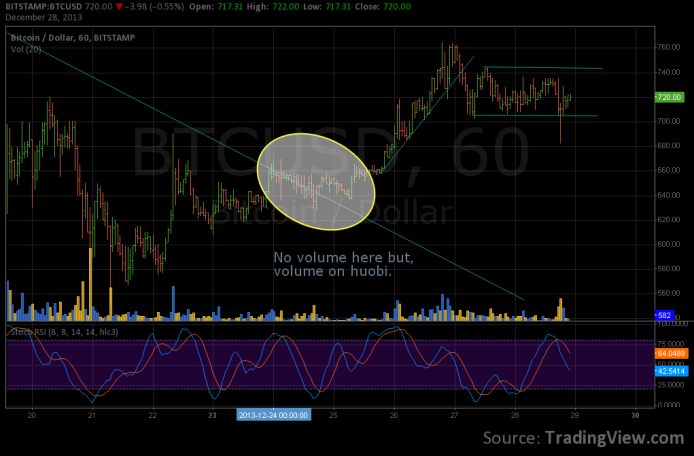 It seems that we are range bound between the $700 and $745 levels for the next couple of days. 31st January, 2014 is also a key date, as more investment into Bitcoin from China is expected to stop from then. The effects of this are expected to be completely priced in on the western exchanges within the first week of the new year.